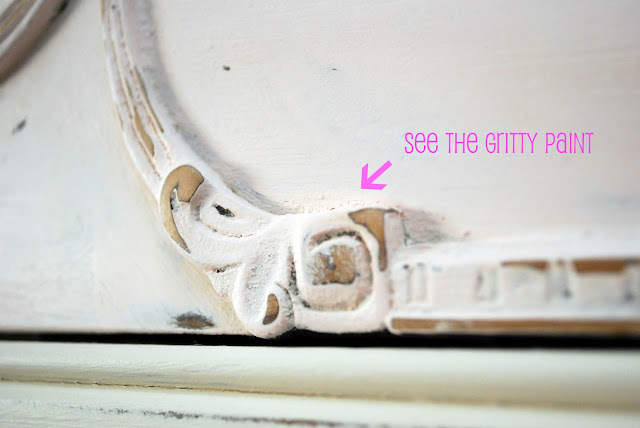 Ever Since I saw Annie Sloan Chalk Paint I fell in love but I did not love the price tag! I have been on the look out for a recipe for the chalky paint. My recipe is a little different from the ones I found. 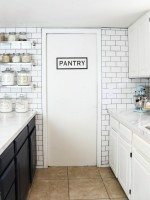 With this chalk paint there is no prep work. I simply brushed on the paint with a plain paint brush. The first time I tried this it was kind of a mess! The paint was VERY gritty and hard to work with. The second time I tried the chalk paint I mixed a little bit of water with the grout and then added the mixture to paint! The result was SOOOO much better! The paint was very smooth but don’t get me wrong the paint was thick but it was way better. The dresser I used my homemade chalk on is a great piece that I bought from my aunt. It is the perfect dresser to help finish Millie’s room. I used Oriental Silk by Behr for the base of the dresser and then I used Cream Rose by Behr for the drawers. What I love about the Chalk paint is that when you distress, the paint has a very soft and dusty. It gives the look of perfectly “petinaed” piece of furniture. I used my sanding to buff around the edges then to finished off the dresser I used a rag and polished on Howard citrus-shield paste wax that I found at Home Depot. I totally love it!!! 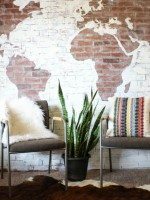 I will use my DIY chalk paint again! The soft pink and creamy white is a perfect match for this piece! What do you think? Do you like the two toned look? So cute! I did the same thing, but will have to try mixing it with water first. Love it!! Do you have to use flat paint? I have some egg shell colors that I already have at home that I would love to do this to. I love the color combo on this piece. Great job! I haven’t used a homemade chalk paint recipe, but i did work in the paint department at a major big box chain so i know a bit about paint. the look of chalk paint is a very flat (matte) finish, finishing with was will protect your finish and give depth to the nooks and crannies. Other sheens of paint- Eggshell, enamel etc., are glossier finishes, scrubbable and wouldn’t’ necessarily require a wax or clear coat to protect the finish. These would work as far as consistency, and application, but the final look of chalk paint will not be achieved due to the glossier (shinier), more modern finish these paints will result in, defeating the purpose of replicating the old fashioned look that makes chalk paint so popular and vintage looking. 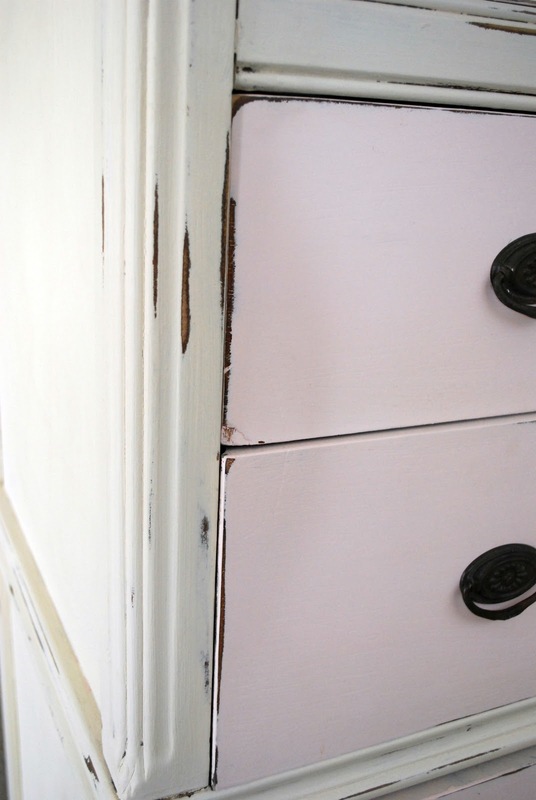 Flat paint gives the “chalky” texture that is the desired effect. Love this and will be trying it myself. nothing paintable is safe in my house! This is so pretty! I love the colors on that dresser! I am redoing a chunky 3 drawer dresser for baby #3 which will also pair as a changing stand. ohhh.. Savannah, this is so pretty! I LOVE that dresser! What a fun and unique dresser…I love the pink and white combo! I love the look!! Very pretty. I have the same question. Do you have to use a flat latex paint? y and waitng! I’m a new linky follower, would love if you followed back. This piece is simply adorable!! LOVE IT!! my first experiment with the homemade chalk paint did not work out to well, but seeing this, I might give it a go again. It turned out just gorgeous. I love it, esp. the pale pink! Great work. Very pretty! I have used my own chalk paint mixture too, I used plaster of Paris, I was pleased with the result. I’ve used plaster of paris too – on furniture and am now using it on blocks I’m painting for my Etsy store. I love the look! Your piece is gorgeous! I love the two toned and the colors you chose. Furniture painting is very addictive to me – I think I’ll be doing a lot of it when the weather gets warmer!! 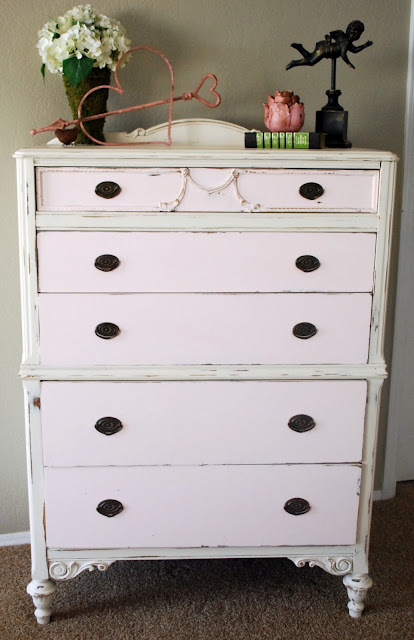 I love, love the pink dresser, but tell me where you found the pink metal heart on the dresser! Sooo cute ! Adorable dresser. 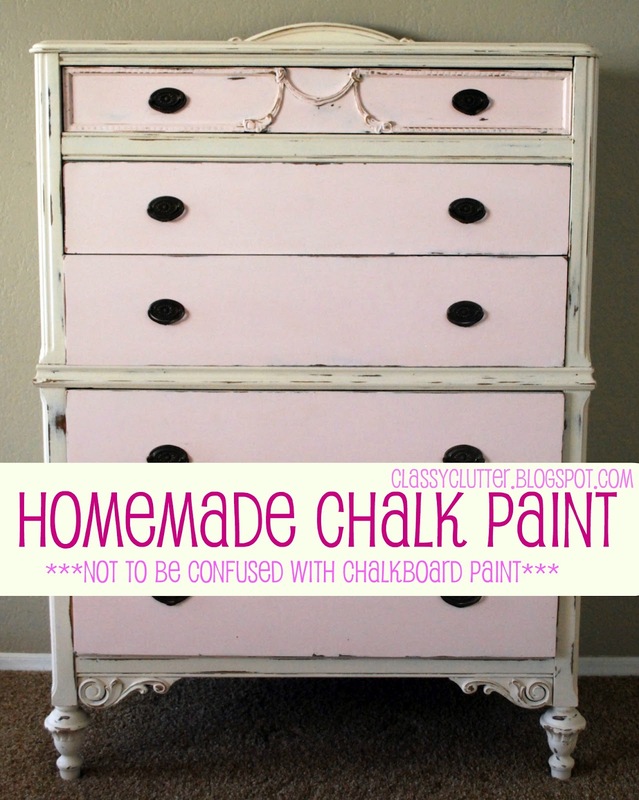 I had no idea you could make your own chalk paint. Wow! Thanks for sharing. Visiting from Miss Mustard Seed-and glad I did! Cute dresser. Turned out lovely! I did one awhile back that is very similar. You can go to my blog at http://www.tresmenandababe.blogspot.com and look at the Ugly Duckling. Yours looks awesome. I love the pink and white together. Nice job. I just painted a chest with some homemade chalk paint. I used plaster of paris in my mix along with some warm water. Worked like a charm. I love your two colors on your chest. It’s just beautiful now. Following with Mr. Linky now. Oh, and I just linked to this post for your chalk paint recipe. If that isn’t okay, just let me know and I’ll remove. I guess I should have asked first, huh? Thanks for the tip. I have also been wanting to try chalk paint, but didn’t want to spend the money. This weekend I will try out the recipe and report back. Your furniture project came out beautifully. I just tried my first chalk paint project and it was so much fun. I’ve not tried adding water. Maybe next time. *Stopping by from tatertots&jello. I have the same question about the flat paint. I don’t like flat. I usually get Semi-gloss because glaze tends to work better. When I try to wipe it off of the flat paint, it peels the paint off. So, does this work with other finishes or only flat? Anyone know? Feel free to email me….these ladies are surely swamped!!!! Love your beautiful dresser! Thank you for sharing your recipe! I love your tips. You said you need to prime and sand, no matter what method you use. I want to try painting furniture for the first time. I renoing a house beach cottage style. I thought with Annie Sloan you didn’t need to prime and sand? What would you suggest for a newbie? I love how girly it is! I use this same recipe. It works wonders. I painted a table the other day without using chalk paint. I forgot how much more work it is to distress. My arms wanted to fall off! Just lovely!!! You used the perfect color combo for this piece! I’m sure it will be cherished for years to come. I use Plaster of Paris in my recipe but I’d like to try yours and baking soda just so I am better equipped to answer questions that pop up from time to time! HUGS!!!! Your dresser is gorgeous. I love that the two-tone is subtle. Very pretty. Thanks so much for sharing this. This is a beautiful refurbished piece. And I love the colors you have chosen. I have so wanted to try Annie Sloans products, but the price and the availablity in our area is impossible. I’ve a few pieces I am anxious to try. I loved the Behr paint I tried a while back, but I like the finish on this so much better. You appeared like magic ! Have a lovely weekend. This looks so amazing! I would love this in my room, thank you for the tutorial!